Almost all deaths (94%) linked to air pollution occur in low- and middle-income countries, the WHO says. Parts of Africa, Eastern Europe, India, China and the Middle East are the biggest regional danger spots. More than 1 million air pollution-related deaths occurred in China and over 600,000 in India in 2012, according to the WHO. But the worst countries for deaths per head of population are in Eastern Europe. 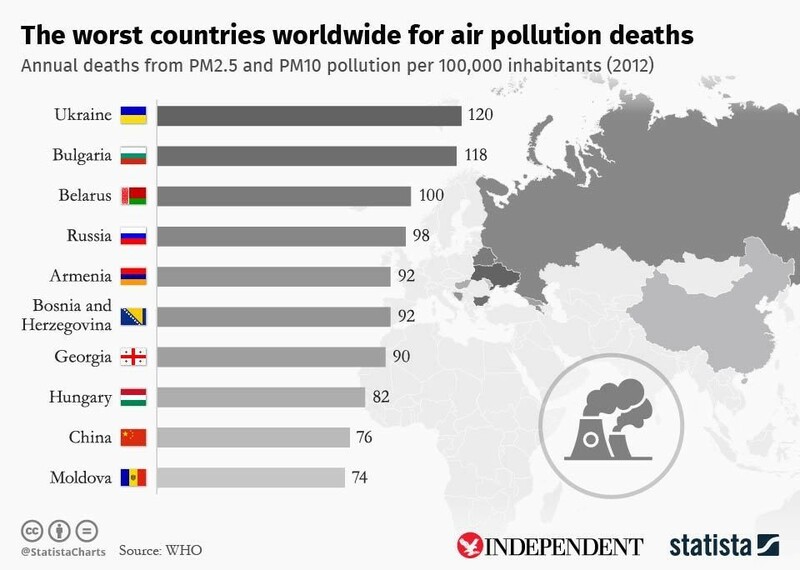 Ukraine, at the top of the table, had 120 deaths per 100,000 inhabitants in 2012. The study by the World Bank and the Institute for Health Metrics and Evaluation (IHME) calculated the economic cost of air pollution. It found that air pollution led to one in 10 deaths in 2013, which cost the global economy about $225 billion in lost labour income. Tiny particles, known as PM2.5, have a diameter of less than 2.5 micrometers and can penetrate deep into the lungs and cardiovascular system, increasing the risk of disease. WHO guidelines state annual average concentrations of PM2.5 should be below 10 micrograms (mcg) per cubic meter, but the vast majority of the world's population is living in areas exceeding this limit.